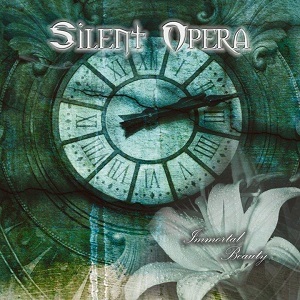 Silent Opera are an Italian band formed in 2007. They released a demo in early 2010 which was well received, and have now released their debut album - Immortal Beauty. The musical style is symphonic metal, with powerful operatic style vocals. This will inevitably lead to comparisons with Tarja Turunen and Nightwish. The vocals are certainly very good - crystal clear, powerful, and well suited to the music. "Always with you" stands out from the rest of the album as its one of the only tracks to use male vocals as well as the female ones. Unusually for a symphonic metal band they have opted not to use the beauty and the beast style - clean female vocals with grunts and growls from the male vocalist. Instead the male vocals are sung as well, and the track works very well. The other track to use male vocals is the fast paced "Your muse" - a relaly great song. Since the album has been recorded and released, two members of the band - Alexandre (Bass) and Lady Victoria (vocals) have left and been replaced. Since the vocals are so key to the sound, it will be interesting to hear how the new singer compares. If you're a fan of female fronted symphonic metal with operatic style vocals then you should certainly check out Silent Opera.